Accurate quantification of myocardial-infarct size is critical for clinical decision making. Transmural extent of myocardial infarct predicts whether or not a patient will benefit substantially from revascularization therapy. To date, delayed-enhancement cardiac magnetic resonance (DE-CMR) imaging is the clinical standard for quantification of myocardial viability. Multidetector CT is reported by numerous authors to be a useful tool for characterizing and, more importantly, quantifying myocardial-infarct size. Thus, cardiac CT is a promising future tool for a complete coronary artery disease diagnostic workup. 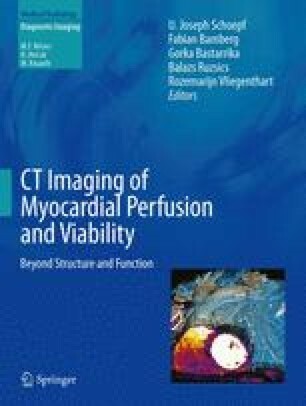 This chapter reviews the role of different CT-based imaging methods in precisely quantifying myocardial-infarct size.